A short note this time, because I've literally covered this ground before. I went for a short ride up the Kennedy Trail on my mountain bike on Sunday. For me, this was the first ride this year when it's been actually hot. The first ride on which I've been wiping sweat from my eyes. And it was probably 70 degrees. It's going to be a long summer. I can't quite remember why I thought it might be a good idea to climb Kennedy again. It's probably just the fact that I'm always looking at that Sombroso ridge whenever I'm driving to my house. It's subliminal. Kennedy Trail begins with a climb up Kennedy Road, during part of which I followed a deer. The early part of the climb was uneventful, except that at every turn I was sure I wasn't going to make it, and would have to turn around. By the time I got to the tree at about the mid-point of the climb, I was done with one water bottle and had only one left. I drink a lot of water, probably more than I really need to, and I have no idea what I was thinking leaving the house with just two. After that tree, the trail climbs a bit more and then levels out for quite a stretch at about 2000 feet. This part of the trail is directly north/south and has great views of the valley. I hadn't noticed before that you get an especially good view of the top of Pheasant Road and the Cherry Springs Reservoir from here. In this shot, you can see the reservoir and the green (soon to be brown) fields next to it where they wanted to build houses 20 years ago. Along the bottom of the frame, you can see the scary disused trail that I described last year. On the next ridge over you can see Reynolds Road climbing up, first pavement and then dirt. And behind that, you can make out the trails in Quicksilver Park running along Mine Hill. One more thing, in between: in the upper right-hand quarter of the shot you can see a huge rock formation (it looks like Reynolds Road heads right for it, but it doesn't). That's on top of the hill next to the Guadalupe Reservoir, but I've never noticed it before. Apart from the little lake, I didn't notice any of that as I was actually standing on the mountain. My camera has better vision than I do, I guess. After this section is a grind in which you climb about 500 feet in a little over half a mile. Then you actually descend a little, climb a couple of steep but short hills, and (if you're me) get off your bike and start walking about a quarter of the way up the final ramp. Ugh. It's steeper than it looks. After the intersection with the Priest Rock trail, I continued toward El Sombroso. I think I counted three more hills that I had to walk up. I hate that. By this time I was completely out of water, and was stopping not only to calm my heart but also to bring my temperature down. Either the energy I expend trying to climb these hills or the fact that I am defeated several times in a row leaves me with the certainty, on this section of the ride, that I can't climb anything at all. The trail climbs the in the last few hundred yards toward El Sombroso, and I was almost surprised to be able to get up there. The last time I rode this way, I half-heartedly looked for a trail that reportedly crosses from El Sombroso to Mount Thayer. At that time I didn't see it, but after reading some hiking reports I decided to take a closer look. The entrance to the trail isn't obvious, but there's only one place it could logically be. It's basically the southern-most part of trail before it heads down the mountain. I pushed between two bushes, and it seemed like there was something vaguely linear about the spaces between plants, so I guess that's a trail. I would have explored a little further on this ridge, but it dips down quite a bit between the peaks and my bike shoes aren't really suited for hiking. The trail is overgrown; I'd definitely suggest head-to-toe clothing (and a winter's day) if you're going to try it. The last time through here, I continued down the trail to Woods Road. This time I turned around and headed the other way, back the way I came, to the Limekiln Trail. I've ridden this trail once before, and I remembered the great views of the canyon. Having a little more experience in the area, I now know that on the other side of that canyon is Soda Springs Road, and I was hoping to get a picture of a road I've ridden up before. Limekiln drops quickly from about 2800 feet to 1500 feet, then climbs back up to 1650 to the junction with the Priest Rock trail. Somewhere near the bottom of that section, after having run out of water before I even reached El Sombroso, I rode by a briskly-flowing stream. Thirstiness being the mother of invention, I filled a water bottle. I fully expecting the water to be beige, but it was clear as... well, water, I guess. It smelled good, which is to say not at all. Having thus run my full suite of chemical tests on the sample, I drank a bit, and did not die. More than 24 hours later, I remain not dead. Look at me, I'm Survivorman! This eastern section of Limekiln Trail exists to service the power line towers, and is thus big enough for a truck to navigate. The western section, from the junction down to Alma Bridge Road, is completely different. It's rocky, and large parts are basically single-track. The first time I came down it I thought it was pretty tricky, and I suppose it is, although it's got nothing on Rocky Ridge or Stiles in Santa Teresa Park. On the other hand, it's largely shaded, where the other two are merciless. The Limekiln Trail passes near the quarry, which I think I must have completely missed the first time I took this trail. It then descends down the canyon and parallels a creek until it empties onto Alma Bridge Road. At one point I had thoughts of crossing back into Los Gatos over the Jones Trail, but after too much climbing I just went down the dam to the Los Gatos Creek trail instead. Along the way I noticed the spillway was still flowing, which I had read about in another local rider's blog. I took this picture in tribute; I'm following his tracks, figuratively and as it turns out quite literally. From there, a straightforward ride home. The Garmin tells me it was 25 miles and almost 3800 feet of climbing, which sounds about right. Insanely low average speed, I must admit. Last month I rode to Mt. Madonna. I had planned to come back along Uvas Road, but I ran out of time (not to mention energy), and ended up getting a ride back from Morgan Hill. So last Sunday I decided to see what I had missed. Open space, and likely to stay that way. I took my road bike out on a cool, sunny morning, heading south on McKean. Along the way I saw what I thought was a depressing sign advertising a new housing development on the west side of the road. If the economy is picking up, I suppose we'll start seeing new developments like that. But I was wrong. This sign was just the opposite — it advertised the fact that the Pennisula Open Space Trust had, in fact, protected the property. McKean bends around the Calero Reservoir, the first of three reservoirs I visited. The parking lot at the reservoir was full of trucks with empty boat trailers, but none of them appeared to be on the water. Odd. On that earlier ride to Mt. Madonna I had stopped near the top of Mt. Chual and saw a dirt road snake down the mountain. That road eventually meets up with Casa Loma, which empties onto Uvas Road. So on Sunday, when I came across Casa Loma, I decided to explore up the road from this end. Coming from Uvas, Casa Loma is a short road to the Rancho Cañada del Oro Open Space Preserve. Past a first parking lot, the road turns into a rough dirt path to a second parking lot and the inevitable gate. On the map it appears that the road runs another half mile or so through open space, so it's a shame that not even bikes can continue. The open space maps imply that the trails around here are open to bikes, so this should be worth a return trip on fatter tires. This isn't exactly an easy place to get to, but the parking lot had plenty of cars. I headed back to McKean, which at this intersection turns into Uvas Road and runs through a sort of valley along Llagas Creek. The little whitewashed bridges that cross the creek from time to time are all dated 1923. I found myself thinking that there probably wasn't much around in those days, but then again there's really nothing much along this road now, either. And that's just fine. At one point along this section I was passed by two new Corvettes, and then three sixties-era Corvettes. No idea where they were going, and needless to say I couldn't keep up. Shortly afterward was the turn-off for Oak Glen Avenue, which runs by the Chesbro Reservoir. The reservoir seemed quite full — I assume that the bases of these trees are not normally flooded. I guess I'll have to take another trip down here this fall to figure out what "normal" looks like. Oak Glen Avenue continues past the dam into Morgan Hill, but since I wanted to continue exploring Uvas Road, I turned around at the dam. About a mile further south on Uvas you reach Croy Road, and again I went exploring up the road. On that Mt. Madonna trip I had also seen the other end of this road, in a sense. Croy Road heads up to Uvas Canyon County Park, which has a trail that heads up to Knibbs Knob and on to Summit Road, where I saw its other end. There was also a report that our recent heavy rains had caused a mudslide across Croy Road, rendering it impassable and briefly trapping some residents. Well, that's worth a look. So far the ride was basically flat, with some rolling bits. Croy Road isn't steep by any means, but has some mean little ramps and ends up climbing to about 1100 feet at the park. My legs were starting to get heavy, and since I wasn't sure what the road further down looked like I was a little worried about wearing myself out. It was on this section that I really started to feel tired. 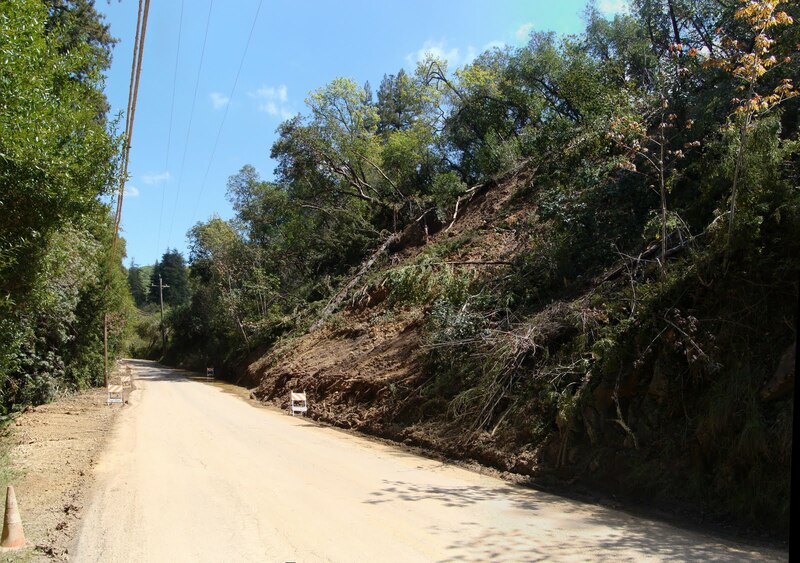 Croy Road follows Uvas Creek up into Uvas Canyon. The road ends at the park, but the canyon continues right up to the slopes of Loma Prieta (the Mt. Madonna post has a good shot of the canyon from Loma Prieta). Just before you get to the park, you run into something called Sveadal, a little resort run by a coalition of Swedish groups. The woods here are tall and thick, and the road narrows to one lane. Immediately after the resort is the entrance to the park, which is predictably lovely and once again absolutely packed, considering how difficult it is to get to. According to the park brochure "uva" is spanish for grape, and all the things named Uvas around here (the canyon, the creek, and by extension the reservoir and road) were named for wild grapes that were once abundant. After a little rest and a quick snack, it was time to head back down to Uvas Road, and then south to the reservoir. Apparently that's Twin Peaks in the middle. Where's the other one? By the time I was passing the reservoir I was pretty beat. When I got to the intersection of Uvas and Watsonville Road, I thought about where to go next. I could go south to Watsonville, which would likely mean that I'd need a car ride home. Or I could go north to Morgan Hill, and home from there. A quick check of the map confirmed that going to Watsonville meant riding over the mountains on 152, which seemed doubly unpleasant. So it was on to Morgan Hill. The last time I came to Morgan Hill it was dark, so I didn't get a chance to look around. The part of the town I had seen was the generic suburb, in which every store must be a national brand surrounded by a huge parking lot. Heading up Monterey Road, by contrast, takes you through a nice little downtown sort of area that actually seemed pretty quirky and livable. Marginally interesting factoid: the town isn't named after a hill. According to the Wikipedia entry, it's named after a person called Hiram Morgan Hill. Who knew? I left town on Hale Boulevard, which evolves into Santa Teresa Boulevard. Before it makes that transformation it runs through many acres of nothing whatsoever. Actually, nothing but wind, wind blowing with gusto the wrong way. But that cruel wind wasn't blowing air, or at least not entirely. It was stinky, which it turns out was probably because I was passing the Monterey Mushroom farm and the nearby "spent compost" heaps. Ripe stuff. A whole lot of nothing north of Morgan Hill. Once you get through the endless nothing, the road turns northwest and heads through the suburbs. About that, the less said the better. In the end it was about 64 miles, just over a metric century. The Garmin recorded about 1900 feet of climbing overall, which is mostly over the rolling hills. I was pretty spent when got back home, but it was a day well spent.